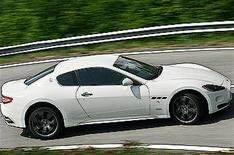 First drive: Maserati Granturismo S | What Car? Maserati's new 4.7-litre V8 engine turns its GranTurismo from a good car into a really, really good car. One criticism of the standard GranTurismo was that its 4.2-litre V8 just didn't deliver the low-down pulling power we expected from a 399bhp sports tourer. The Granturismo S has no such worries - it has plenty of oomph even from the lowest of revs. That power is delivered through a new six-speed electro-actuated gearbox. Gear changes are made via elongated paddles on the steering column, but the driver can also select an automatic mode. The gearbox also has a function called MC Shift that allows extra-quick gearchanges to be made at high revs. The S sits on bigger alloy wheels than the standard car, has stiffer suspension and uses the braking system from the Quattroporte. The suspension tweaks make the already firm ride that bit harder, which, along with the power hike, shifts the car's emphasis from being a grand tourer to more of a sports car. The fun really starts when you hit the little button labelled 'Sport' on the dashboard. That operates valves in the exhaust that open a short-cut to let the gases run out, and the effect is immediate - the exhaust barks and growls. It's fantastic when showing off, but it can get tiring on the motorway. All these additions come at a price - the Granturismo S is than £11,000 more than the standard car. When you add some of the desirable extras from the options list - sat-nav, Bluetooth, even metallic paint - you won't get much change from £100,000.